This refreshing salad combines sweet strawberries, crunchy toasted almonds, and salty feta with a delicious honey-balsamic vinaigrette. For the carnivores, optional basil-balsamic grilled chicken tops it off. 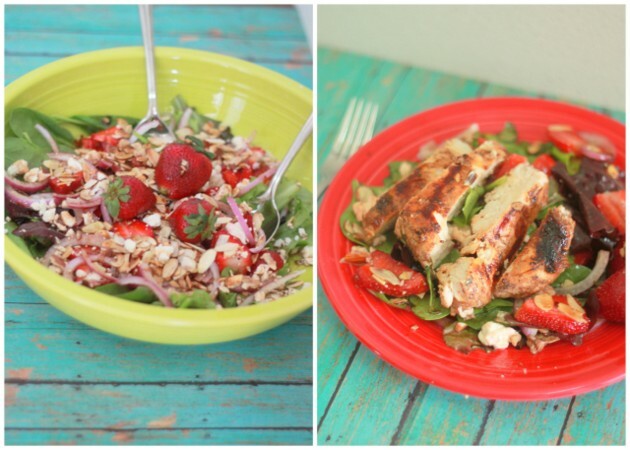 Say hello to my new favorite salad – and my guy’s new favorite chicken recipe. 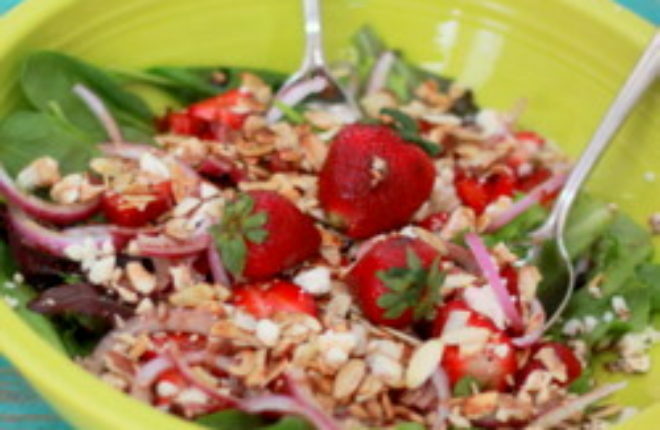 This amazing salad combines sweet strawberries with salty feta along with the zip of red onions and the nice crunch of toasted almonds. The vinaigrette makes it, though. The honey and balsamic vinegar set off the flavors of the salad just so. The optional balsamic-and-fresh-basil marinated and grilled chicken is tender, moist, and full of flavors that complement the dish perfectly – and it’ll make the carnivores in your life happy. This terrific salad makes a very satisfying dinner, with or without the chicken. And with spinach and strawberries in season, it’s the perfect salad for right now. If including chicken, pound the chicken breasts to approximately 1/2 inch thick. Add to a gallon-sized Ziploc bag (I actually pound it right in the bag then add the marinade. I'm a little worried about causing holes, but it hasn't happened yet). Whisk together the olive oil, balsamic vinegar, garlic, basil, salt, and black pepper. Pour over the chicken in the bag. Refrigerate for at least an hour, up to 12 hours. Grill for about three minutes on each side until cooked through. Set aside. Make the salad dressing. Whisk together all the ingredients - olive oil, balsamic vinegar, honey, garlic, and salt. Refrigerate for at least an hour, if possible, so the flavors meld. Toast almonds in a saute pan on medium high for about 4-5 minutes, stirring frequently, until you can smell them/they look toasted. Set aside and let cool. 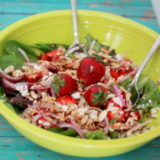 In a large salad bowl, toss together the mixed greens, spinach, strawberries, onion, feta cheese, and cooled sliced almonds. Just before serving, pour the salad dressing over the salad and gently toss again. Cut the chicken into slices, if using, and place it atop individual servings as desired. This is Just my kind of food! With or without the meat. I only eat meat about 2-3 days a week and I love your concept of showing one dish two ways! What a great blog, I’m happy I found it! Thanks so much, Anna! I’m glad you found me too. Have a wonderful day yourself!